Don’t worry if you can’t make it to Las Vegas to watch today’s weight competition because you can stream the “UFC 109: Relentless ” weigh-ins live right here on 5thRound.com beginning at 7PM ET/4PM PT. 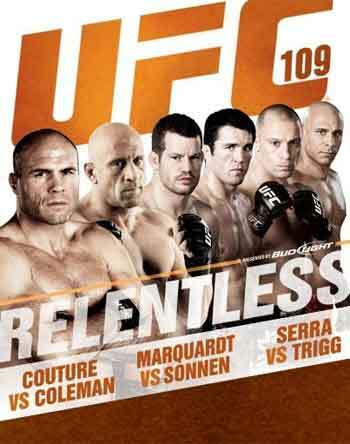 The show will be headlined by a light heavyweight matchup between UFC Hall of Famers Randy Couture and Mark Coleman. Opening for them will be a potential middleweight top contender scrap between Chael Sonnen and Nate Marquardt. Please click on the UFC media player below to watch today’s weight competition. If you don’t want to watch the weigh-ins and want to zoom straight to the results, you can check out out “UFC 109: Relentless” Weigh-in results HERE.